Gift Certificates for professional cleaning services make perfect gifts for any occasion, but especially for Mothers’ Day, Fathers’ Day, birthdays, anniversaries, and as a thoughtful “thank you” gift. 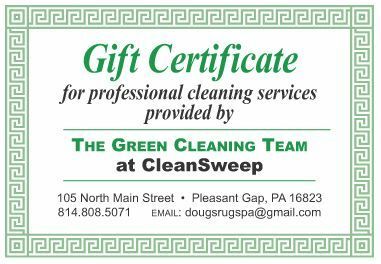 Gift certificates can be purchased in any amount (starting at $25) and can be used for any of the professional cleaning services provided by CleanSweep. All of our carpet cleaning customers receive a free 16 ounce bottle of carpet spotter with free lifetime refills!